O’Reilly recently held a 1/2 price sale for electronic versions of some of their newer books. I bit on Mining The Social Web 2nd Edition by Matthew Russell. Having just started the book, I’m not yet in a position to really comment, but I was intrigued by several aspects. Basically the book is about using the Python programming language to access social media sites through their API (application programming interface). Instead of having the reader set up Python on your own machine, he created a virtual environment that could be run on any platform using a program Vagrant. 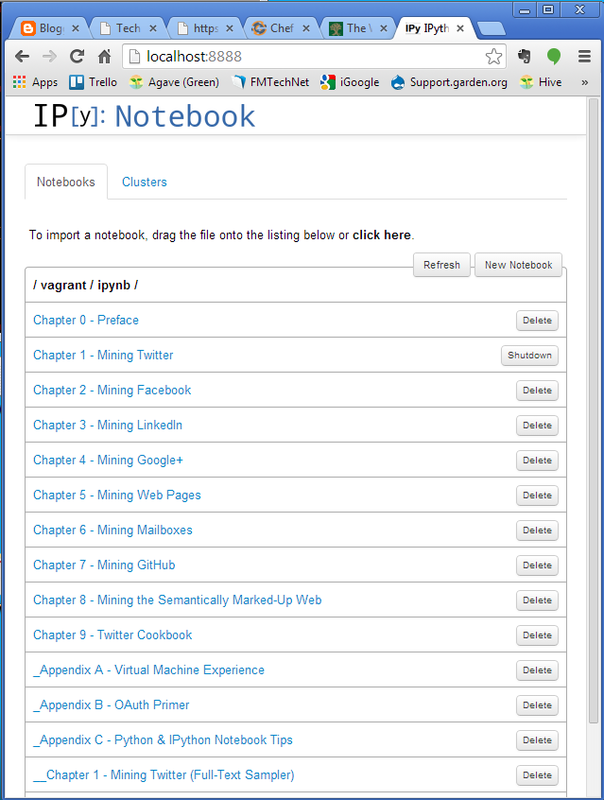 The VM uses a Python teaching framework called IPython Notebook which allows you to have interactive code examples embedded in text. The combination of the virtual machine, Vagrant and IPython Notebook obviates the need to document and maintain all the possible permutations of each platform (Mac/Windows/Linux) and version of Python, all the related ancillary libraries, and whatever is needed to install and maintain updates. The repository for all of the Python code used in the book and the setup for the Vagrant virtual machine is on GitHub. GitHub is a cloud-based version control system, with a lightweight social media overlay that allows people to collaborate on programming projects. 1. Download and install VirtualBox if you haven’t already. 2. Download and install Vagrant. 4. Download the GitHub client. This includes two applications, the GitHub terminal, and the GitHub GUI Manager. 5. Using Git, “Clone” the GitHub directory for Mining the Social Web Second Edition. This makes a copy of the GitHub directory on your local machine. 6. Start a command line session, and CD to the MTSWSE directory (whatever you’ve named it) Run vagrant up. This starts the creation of the virtual machine, and the full provisioning. It is about a twenty minute process. And, to be sure, given all of the output that it generates, it looks as if a multi-hour job has been automated. A couple troubleshooting tips. If Vagrant looks like it is installing “the default VM”, or if you see a reference to PROCESS32 you’ve somehow missed the GitHub part… maybe the directory is wrong? What you should expect to see instead is PROCESS64. That will bring up the main page of the IPython book..
DL is deprecated, use FIDDLE. The Vagrant documentation refers to another program called Chef. Chef manages the provisioning of servers, and is used especially in cloud,VM and multi-server installations to manage all of the server instances. This entry was posted in Uncategorized on February 28, 2014 by lkeyes70.